The Clos Windsbuhl vineyard enjoys long cool and late ripening conditions. As gewurztraminer is a grape variety that enjoys some sun and heat just before the harvest, we always worry that it will struggle to reach perfect ripeness in this vineyard. Fortunately we always worry for nothing! Certainly the perfect exposure and poor calcareous rocky soil must partly compensate the cooler climate, but more importantly, the longer ripening process allows the grapes to develop a huge aromatic complexity while retaining great structure. 2007 was partially botrytised and therefore the grapes reached very high ripeness level with one of the highest acidity for this grape. 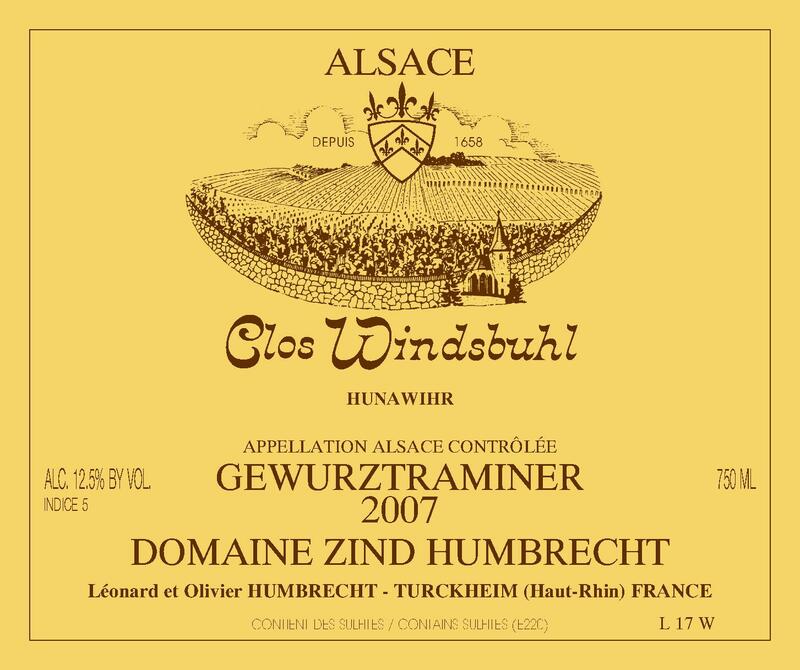 The fermentation was the slowest, keeping a large amount of residual sweetness with a lower than usual alcohol level and it is not surprising that this was the last gewurztraminer bottled in 2007, at the exception of the SGNs. 2/2009: the nose is so open and aromatic that it is hard to believe it comes from the Clos Windsbuhl. This is an extremely aromatic wine, showing lots of exotic fruits, litchi, and jasmine flowers. It would sound almost too much without the racy and elegant character of the Clos Windsbuhl. The palate shows extreme elegance. The sweetness is very well present, especially on the finish, but it tastes also so smooth and elegant. The higher acidity is there to balance the whole palate. It clearly has a late harvest style and I start to wonder why we didn’t classify this one as such… perhaps because it really is so enjoyable now!